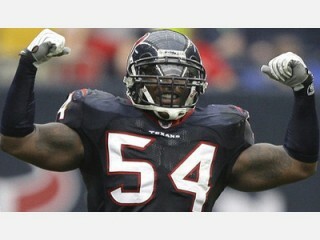 Zac Diles is an American football linebacker for the Houston Texans of the National Football League. Drafted by Houston Texans in the seventh round (218th pick overall) in the 2007 NFL Draft…Signed by Texans on July 19, 2007. Young, versatile linebacker that started the first eight games of 2008...has the ability to play both middle and outside linebacker, but settled in to the SAM linebacker position last season…finished second on the team in tackles with 66 stops…for his career Diles has 128 tackles…made eight special teams tackles as a rookie. Started at weakside linebacker vs. the New York Jets (9/13) totalling four tackles (four solo)...had three tackles, including one for a loss ast Tennessee (9/20)...contributed five tackes (four solo) and a fumble recovery vs. Jacksonville (9/27)...made four tackles (two solo) including one for a loss vs. Oakland (10/4)...made two solo tackles at Arizona (10/11)...started at WLB where he assisted on one tackle and appeared on special teams at Cincinnati (10/18)...had seven tackles (four solo) vs. San Francisco (10/25)... made three tackles (one solo) in Texans win at Buffalo (11/1)...saw action at linebacker and on special teams at Indianapolis (11/8)...was second on the team in tackles when he made nine tackles (eight solo) and forced a fumble vs. Tennessee (11/23)...played at linebacker and on special teams vs. Indianapolis (11/29)...recored eight tackles (six solo) inlcluding two for a loss at Jacksonville (12/6)...made four tackles (three solo) including one for a loss vs. Seatlle (12/13)...made four solo tackles at St. Louis (12/20)...made one solo tackle at Miami (12/27)...made six tackles (four solo) and forced a fumble vs. New England (1/3). Started the first eight games of the season before breaking his left tibia in practice…despite playing eight games he finished second on the team with 66 total tackles…also posted one sack, one forced fumble and his first career interception…made his first career start at outside linebacker at Pittsburgh (9/7)…recorded a game-high and career-high 13 tackles, 11 solo…posted eight total tackles with five solo and three assists at Tennessee (9/21) and forced a fumble in the first quarter…totaled nine tackles with six of them being solo tackles vs. Indianapolis (10/5) and made the first interception of his career in the second quarter off of Colts QB Peyton Manning…posted six tackles including the first sack of his career in the first quarter vs. Detroit (10/19)…led the team with 12 total tackles vs. Cincinnati (10/26)…led the team in tackles with nine, including five solo at Minnesota (11/2)…was placed on injured reserve after breaking his left tibia during non-contact drills in practice. Saw action in 11 games as a rookie, mostly on special teams…saw extended playing time at linebacker late in the year…finished the season third on the team with nine special teams tackles and tallied five tackles on defense…made his NFL debut vs. Indianapolis (9/23), seeing action on special teams…served as a game captain and earned his first action at LB, finishing with one solo tackle and one special teams stop at Cleveland (11/25)…saw most extensive action of the season at LB and finished with a three solo tackles vs. Jacksonville (12/30). Appeared in all 24 games in his two seasons at Kansas State…two-time All-Big 12 honoree…started all 13 games during the 2006 season…collected 149 total tackles, including 13 for losses, for a rock-solid average of 6.2 stops per games…also forced three fumbles, notched two pass break-ups and had an interception…returned lone career fumble return for a touchdown at Missouri in 2006…selected to play in the inaugural Inta Juice All-Star Classic in Houston…began college career at Fresno City College, where he started 22 games over two seasons and led the team to a Valley Conference Title and a berth in the 2004 California North Division championship game as a sophomore. Prepped at Tulare High School in California’s central valley…in addition to football, he also lettered as a forward in basketball and as the right fielder on the baseball team…was active in the community at Kansas State, making regular hospital visits and reading to children…played the saxophone and piano as a child…born Zachary Lee Diles in Abilene, Texas.